In the second post I will guide you through configuration of networks and providing network connectivity to Blade Servers. After quite long introduction and setup it is time to setup some networking. We start our Virtual Connect Module networking configuration in Shared Uplink Sets section. 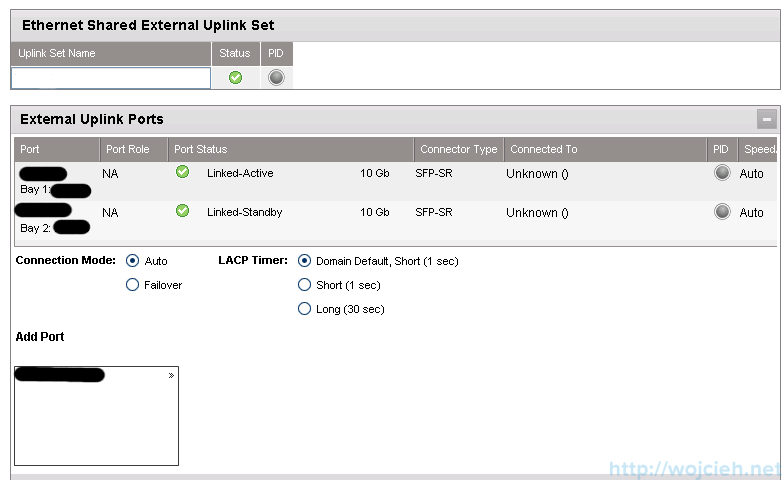 Give Uplink Set meaningful name and select ports where you have connected uplinks. Select LACP Timer – best idea would be to discuss this setting with networking team. 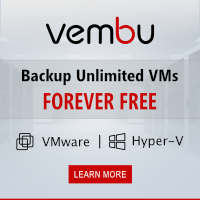 Remember that settings configured in Virtual Connect have to cooperate with existing networking infrastructure. Next step is to add VLAN tagged networks in uplink set. Native – Identifying an associated network as the native VLAN causes all untagged incoming Ethernet packets to be placed onto this network. Only one associated network can be designated as the native VLAN. All outgoing Ethernet packets are VLAN tagged. Smart Link – Enabling Smart Link configures the network so that if all external links lose their link to external switches, Virtual Connect drops the Ethernet link on all local server blade Ethernet ports connected to that network. This feature can be useful when using certain server network teaming (bonding) configurations. Private Network – The Private Networks option provides extra networking security. 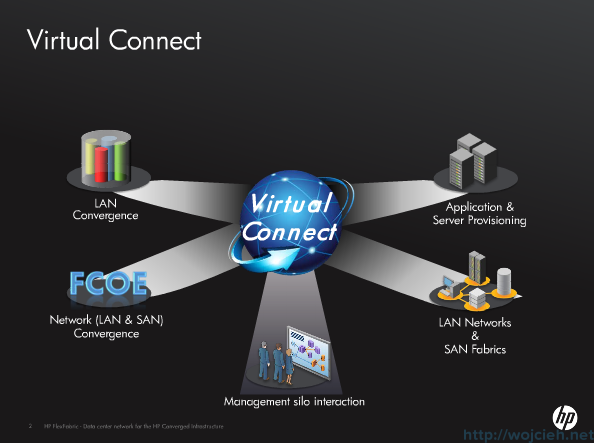 When checked, the network is configured so that all server ports connected to it cannot communicate with each other within the Virtual Connect domain. 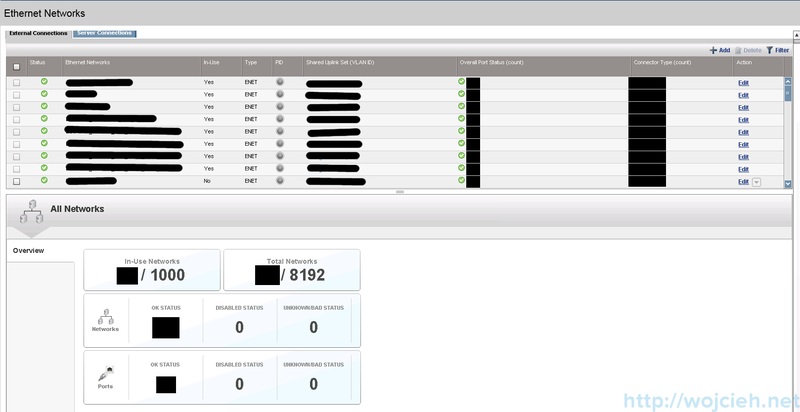 All packets from servers are sent through the VC domain and out the uplink ports only. Servers on the network can only communicate with each other through an external Layer 3 router that redirects the traffic back to the VC domain. The last thing to provide networking connectivity to servers we need to create server profile which will have desired networks. In order to do it navigate to Server Profiles and click icon to create new profile. Next window will open where you can configure networking for blade. Below you see empty profile without any settings. Here is sample profile where one network adapter is assigned to one Ethernet network. Simply click Select a network and pick it from previously created networks. Ethernet Adapter Connections: Select as many networks as required. In my example I have eight network adapters. Port Speed Type: You can select it according to your needs. If the speed type is “Auto”, the maximum port speed is determined by the maximum configured speed for the network. If the speed type is “Preferred”, the speed of the network is the same as the preferred speed of the network to which the connection is associated. If no preferred speed is configured for a network, it defaults to “Auto”. 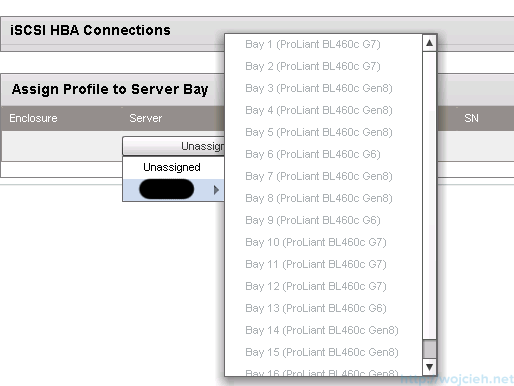 Last thing you have to select is Assign Profile to Server Bay. In order to have multiple networks in NIC select Multiple Networks and select desired networks from the list. The last thing to do is select speed for NIC. And here you can see how complete profile looks like. Please bare in mind that even though you configured speed for your network connections you will not see it in profile until you power on your server. In the last section of this post I would like to share with you some interesting links to documentation and guides. I have two cables today one for nfs and one for vnet. Started like this for testing. Just got anoter virtual connect module and 6 new sfp+ cables. Is one 2 cable 10gb lacp trunk for nfs from each VC module and one 2 cable 10gb lacp trunk for vNets in each vc module a good solution? 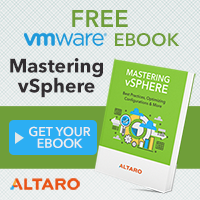 ONly using c7000 for vmware. so then disable smartlink in vc and then enable beacon probing i vswitches? do you have step by step configuration brocade in c7000? Unfortunately I didn’t have access to Brocade Switches. internet site (:, regards for posting. 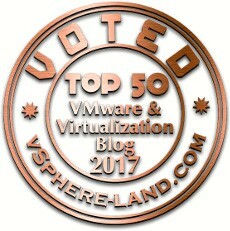 Question- is it still the case with Vsphere and Virtualconnect, that LACP cannot be configured on the distributed switch itself within Vsphere? We have a 4 enclosure setup, and each host has 4 nics(flexnics). The admin created LAGs within the LACP configuration of the dvswitch. Isn’t this not needed because the c7000 has flexnics? Hi Mike. Can you share a little bit more about your setup? Ideally, a diagram would be the best.